Judd Foxman's father has died, and his last dying wish is for Judd, his siblings and his mother to sit shiva for him for seven days. This means his family, which hasn't been together in years, will have to spend an entire week together in their family home, rehashing old grudges, exposing secrets and trying to figure out what the future looks like. On top of that, Judd recently learned that his wife has been sleeping with his boss for the past year, which means he's not only on the road to divorce, but also unemployed and living in a dingy basement apartment. Life is not exactly going well for Judd. 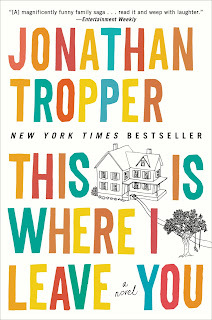 This Is Where I Leave You by Jonathan Tropper has to be one of the funniest books I have ever read. I absolutely loved this book, laughing out loud many times. I love the way the characters interact, the dialog, the little comments made to each other that seem so realistic. The family is completely dysfunctional, yet so real. His sister is there, with her workaholic husband and three kids, the youngest of which is "crying it out." His older brother is there with his wife who is beyond obsessed with getting pregnant. His younger brother, the perpetual screw-up, is there with an older woman who is hoping to change him. And then there's his mother, the mourning wife who thinks short skirts and shirts that show off her enhanced breasts are a good choice for the event. It's hard to decide who is the most dysfunctional in this family! And yet, I loved them all and the way they all interacted. I think I've found a new favorite author. Tropper's writing style is so easy to read, flowing smoothly between what's happening in the present, memories of the past and even Judd's dreams. The dialog is what makes me laugh the most. Everything comes together and makes sense, even though most of the issues are never fully resolved. I can feel myself in the presence of this completely dysfunctional family, and I love every minute of it! I highly recommend this book if you're looking for something funny but real. This review was written based on a copy of This Is Where I Leave You that I borrowed from the library. This is book #4 for the Support Your Local Library Challenge and book #20 for the Countdown 2010 Challenge.